Prof. Tarek Rashid Rahmi, President of the University, accompanied by Prof. Atef Abu Al-Nour, Vice President for Community Service and Environment Development, Prof. Magda Hajras, Vice President for Graduate Studies and Research, and Accountant Samir Najjar General secretary of the University, opened the exhibition of the activities of the Seventh Environment Week, and the special units of the Department and Colleges, which held from 14 to 18 April. At the beginning of his tour of the exhibition, Prof. Tarek. 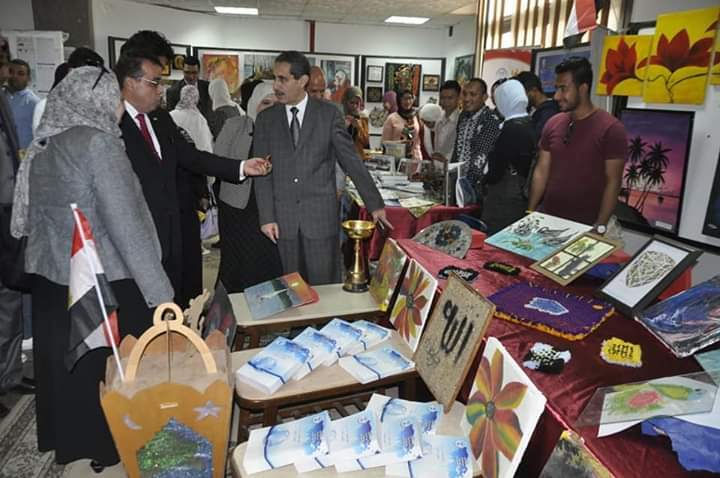 Rashed Rihmi cut a ribbon decorated on behalf of Suez Canal University, prepared by the Faculty of Tourism and Hotels at the top of its exhibits of foods, pastries and sweets. The President of the University inspected the different suites of the exhibition. The colleges, units and centers of a special nature were present in the presentation of their services and products to the community and the surrounding environment inside and outside the university. Such as the central printing press, printing and publishing center. Under the theme of our environment, our students presented the exhibition of handicrafts, bedspreads and drawing on the skin. The university president and his companions visited the two educational farms of the agricultural and veterinary colleges, including poultry production, municipal meat, meat and dairy products, and fresh vegetables. The Confucius Institute at the University also presented the Chinese culinary exhibition and the most famous Chinese cuisine. All Rights Reserved To Suez Canal University 2016.